European companies play a crucial role in getting out of the crisis and in reaching the goals of the European 2020 strategy for sustainable, inclusive and smart growth. 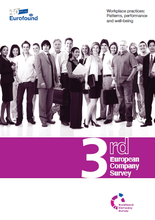 The main focus of the third European Company Survey was on work organisation, workplace innovation, HR practices, employee participation and social dialogue. The survey, carried out in the spring of 2013, maps a number of practices used in European workplaces, as well as how they are discussed and negotiated at workplace level as well as some of their outcomes. The main topics covered were work organisation, workplace innovation, HR practices, employee participation and social dialogue. The survey encompassed 32 countries in Europe and involved interviews with management representatives in 30,000 establishments and employee representatives in 9,000. Set against the background of the recent crisis, the survey aims to show that implementing certain combinations of workplace practices can have a positive effect on outcomes for both workers and companies. The first findings report from the third ECS, launched in November 2013, presents a number of initial results, which have since been expanded on following in-depth analysis of the survey results which is on-going. The overview report Workplace practices – Patterns, performance and well-being (March 2015) offers a detailed guide as to how these practices have been discussed and negotiated at workplace level. Overall, the third ECS finds that establishments that use joint employee-management decision-making on daily tasks, have a moderately structured internal organisation, and make a small investment in HR management – while facilitating direct participation – score best both in terms of company performance and workplace well-being. The report Workplace innovation in European companies (September 2015) examines the motives behind the adoption of workplace innovation practices (WPI) and analyses the impacts from the perspective of different players – organisation, management, employees and employee representations – in 51 companies across 10 EU Member States. The main motives for introducing WPI are to enhance efficiency, increase competitiveness and reinforce innovation. An additional outcome is that the position of both employees and employee representatives seems strengthened. The report finds that WPI often leads to improved economic performance and better quality of working life for all concerned. The list of companies (PDF 119 KB) and the 51 case studies are available for download. The report Direct and indirect employee participation (December 2015) studies practices in EU establishments for direct and indirect employee participation in decision-making. Indirect employee participation is the involvement of employee representatives in decision-making processes, while direct employee participation describes direct interaction between employers and employees. The study builds on the survey data from the Third ECS and focuses on how direct and indirect employee participation are related to each other and to national-level industrial relations characteristics. The report Innovative changes in European companies (June 2017) explores which workplace practices have the strongest links to innovative company behaviour, looking at innovation in the form of new or significantly changed products or processes, new or improved marketing methods, and organisational change. It also explores links between innovation and company performance and workplace well-being, and examines the role of social dialogue in enhancing performance, well-being and innovation. The third ECS was implemented by Gallup Europe and covered a total of 32 countries (27 EU Member States and Croatia, Former Yugoslav Republic of Macedonia, Iceland, Montenegro and Turkey). The target sample size for all 32 countries was 29,950, ranging from 300 to 1650 depending on the country size. Interviewing took place from February to May 2013 and, as for the previous waves, interviews were carried out by telephone with managers and employee representatives in the language(s) of the country. The questionnaire was prepared in cooperation with Eurofound's stakeholders and experts in the relevant fields. Preparatory work on high performance workplaces [.pdf, 216kb] and workplace social dialogue [.pdf, 589kb] was carried out in the lead up to the survey. Quality control is an important element of all Eurofound surveys and measures will be applied in all phases of the third ECS to ensure that expectations of a high quality survey are met. Questionnaires in all languages are available, as well as further information on methodology. For further queries, please contact Sophia MacGoris.